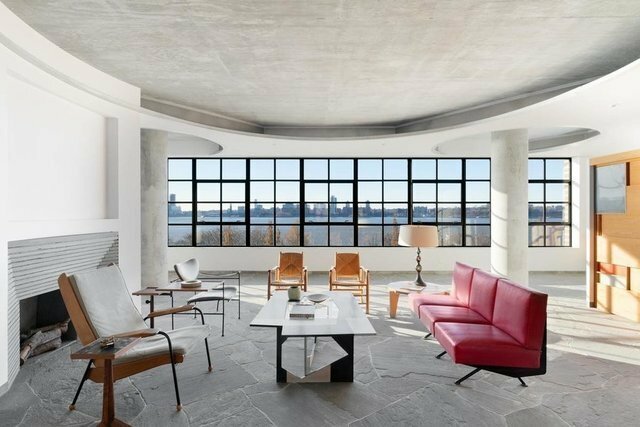 Enjoy brilliant light and uninterrupted Hudson River views from 64-feet of continuous steel ribbon windows in this rare and sophisticated full-floor loft located in Carey Tamarkin's highly coveted 495 West Street - the ultimate private West Village waterfront address! Designed by Robert Marino and inspired by the French mid-century industrial aesthetic, this singular residence features an open flexible floor plan and is a study in the creative expression of architectural materials and the interplay of form and light. A keyed-elevator entrance leads to a dramatic sun-drenched entertaining space with heated bluestone floors, a wood-burning fireplace, a custom wet bar and mesmerizing water views as far as the eye can see. Concentric circles on the ceiling, underscored by concrete columns, pay homage to the great French designer Jean Prouve and define the flexible living areas below including a large Library with custom bookshelves and a sun-filled lounge, both of which can easily be reconfigured into second and third bedrooms. The oversized eat-in-kitchen, with expansive views of the river and lush tree-tops of the Hudson Waterfront park, offers custom milled cabinetry and state-of-the-art appliances. The spacious and bright corner Master Bedroom suite is a serene sanctuary with a large walk-in closet and a windowed en-suite Master Bath, both in keeping with the home's mid-century design vision. The entire loft exudes a sense of calm and stillness enhanced by the meditative effects of the ever-changing Hudson River with its magical sunsets and the twinkling lights of the New Jersey shoreline in the distance. Additional amenities include multi-zoned central air-conditioning, a separate laundry room, copious amounts of storage, and custom Lutron lighting on dimmers throughout. All this, in a rare, full-floor boutique condominium on the Far West Village's "Gold Coast," where residents enjoy protected views of the Hudson River and the kind of privacy and anonymity that are ensured by a key-locked elevator and 24-hour doorman. The building is located directly across from the Hudson Waterfront Park and is steps from the cobblestone charm of the historic West Village, the sought-after restaurants and boutiques of the Meatpacking District, The Whitney Museum, The High Line, and all that is Downtown. Truly one-of-a-kind!